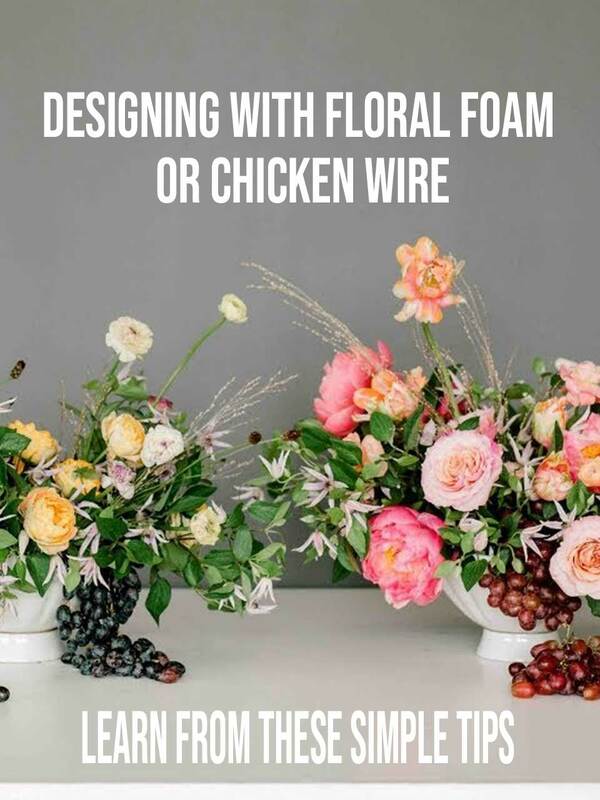 Knowing when and how to use floral foam or chicken wire as your arrangement base is something every floral designer should know. When I first started in the business, both floral foam and chicken wire were used. Gradually, foam replaced wire as the base of choice for many floral designers, especially those new to the industry. But like everything else, what goes around comes around. Today, the use of chicken wire is on the rise again, due in large part I believe, to the popularity of more free-form design styles. If you are a floral designer who’s serious about upping their game, then check out this video by Shean Strong. In it, Shean walks you through how to design a beautiful floral arrangement using either floral foam or chicken wire. I think you’ll really like this tutorial, especially if you really into the nuts and bolts of floral design. Watch it and see if you agree. Well, did you learn a lot from the video? I certainly hope you did! And I also hope you add these techniques to your personal design arsenal. And while we’re on the subject, many of the fresh materials, like the clematis, peonies and garden roses used in these arrangements can be purchased online at websites like FiftyFlowers. They carry a more extensive line of designer flowers. Other sites such as GlobalRose or BloomsbytheBox might also be worth a look, as they are very price-competitive on many of the flowers used. A word of caution. Some of the flowers used in the video are not inexpensive. So if you are only planning to do an arrangement or two using the same flowers, I would suggest ordering them through a local florist. You can find chicken wire on Amazon or at many craft sites like Michaels and Hobby Lobby. Check with your local florist or hardware store, too. That said, let me take a minute to introduce myself. My name is Greg Johnson, and I’m the guy behind FlowersFloralFlorist, and the owner of Greenfield Flower Shop. Okay, before we continue, I’ve gotta level with you. In reality, my own selfish needs are really what prompted me to create this site. You see, I love watching floral design tutorials (like the floral foam or chicken wire workshop you just finished viewing), and a site where I could store and share my favorites is really what I was after. If can build an awesome website that other folks enjoy close to as much as I do, and I can perhaps earn a little revenue, then I personally don’t see an issue. I’m a pretty straightforward person if you couldn’t tell. Still… any possible monetary benefit is incidental, and I’m not here to sell you anything. And that explains the existence of FlowersFloralFlorist. It’s merely an “all under one roof” resource for both myself and others who are interested in learning floral design. So come back any time you’d like to! I’ll simply continue to share top-notch videos about wedding flowers, everyday floral design, and plant information… and any other floral topics I run across. No matter if you’re interested in that or not, it would still be very nice of you to click the Facebook “Like” button or the Twitter “Follow Me” button (or both), on the right-hand side of this page. Lastly, I love reading your comments. So please do use the comments section below to let me know what you thought of the tutorial!